When you need help or advice as a parent about your child or adolescent's education or difficulties with special educational needs, there are a number of options. A while ago, you may remember we featured Tess, who works as a parental support with IASS, or Information, Advice and Support Services. They used to be known as Parent Partnership and are an "arm's length" service, funded by your local authority. Today, IASS's Chris Rees has written for us with a more in-depth look at the service. Every child and young person with special educational needs and/or disabilities (SEND) and their parents and carers, are entitled to receive free and impartial information, advice and support from a service based in their local authority. Although this support is not a brand new element brought in by the recent SEND reforms, it has been drastically changed from what was on offer in the past. 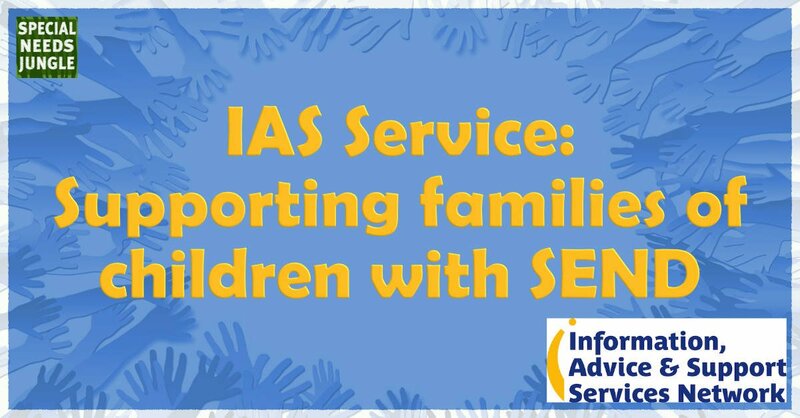 For more information please see the IASS Network website where we have a section which gives a full explanation of the role of an IAS Services and a set of FAQs for parents and professionals. Our website also has a map with the details of all IAS Services across England so that children, young people and parents can easily contact their local IAS service. Following the reforms we also developed a website specifically aimed at children and young people who may be interested in receiving support from their local IAS Service. This has sections on how to contact a local service (with details of services across England) and explanations of how IAS Services can provide support to children and young people. IAS Services - Independent or Impartial? At arm’s length of the local authority. The issue of independence and impartiality is something that is often misunderstood or misinterpreted. Regardless of whether an IAS Service is based within the local authority, or whether it is outsourced to a local organisation (which approximately 30% are), an IAS Service is fulfilling a statutory duty directly on behalf of a local authority - it is not possible for them to be giving ‘independent’ advice and support, and nor should they feel they need to - the law (and associated guidance) is clear on this matter. The function of an IAS Services is to advise children, young people and parent/carers on the situations they face, and on any choices they may have. The advice and support provided should be impartial (i.e. without bias) and based only on relevant SEND law and national guidance. For example, as well as providing direct support to children, young people and parents, one of the roles of an IAS Service should be to highlight and challenge any examples of unlawful local practice. However, we are aware that the issue of the impartiality of IAS Services is something that can be problematic, but it is something that is taken extremely seriously by all the IAS Services we support. A great deal of work every year goes into ensuring that IAS Services fulfil this vital part of their role – this includes the provision of independent legal training to all IAS Services (delivered by IPSEA) and the annual IASS Quality Standards report which includes a section on IAS Services being able to evidence their impartiality. In a recent survey of over 900 parents who had used an IAS Service, 96% said their local IASS was 'neutral, fair and unbiased'. As statutory services, IASS have an unavoidable link to their local authority, but this does not stop them being able to provide effective IAS in an impartial manner and we hope this issue would not put off any young people or families from contacting their local service to get much needed advice and support. When doing this it is important to make clear what exactly it is you are unhappy about, and provide as much evidence and information in order to explain your complaint as fully as possible. If your concern is regarding the capacity of a service (for example, the time taken responding to a query or less support offered at meetings), this may be indicative of how an IAS Service is funded, and such a complaint may be best directed at the local authority. We have seen, and continue to see, that IAS Services across the country are facing extensive funding cuts – significantly affecting their levels of staffing and therefore their capacity to provide support. Since the reforms took place, IAS Services have been expected to provide a much greater level of support (see table above) even though many receive the same, or even less, funding than they did when functioning as a Parent Partnership. We are based at the Council for Disabled Children and we receive funding from the Department for Education (DfE) to provide support to IAS Services across England so that they can do their jobs as well as possible. At the heart of any IAS Service is the provision of impartial legal advice, and so this is where a large part of our support is focused. We provide a range of training opportunities to IAS Service staff and volunteers to ensure they have an accurate and up to date understanding of SEND law/guidance. We commission three levels of SEND law training from IPSEA, which is provided through online modules and face-to-face training days. In recent years, we have also put on additional training events covering a range of subjects including Tribunal support, health & social care, supporting post-16 and working directly with children and young people. Last year IASS staff and volunteers from across the country completed over 600 online modules, and 550 training places were taken up. We do not manage any of the IAS Services, nor are they accountable to us. However, we do monitor local and national practice on IAS Services – raising and feeding back concerns and instances of unlawful practice to the DfE. Part of this strategic work includes hosting the SEND Information Organisations Group (SENDIOG); a network of organisations who provide free advice to children, young people and their parent/carers on matters relating to SEN and Disability. The current membership of the group includes IPSEA, SOS! SEN, Contact a Family, Sense, the National Deaf Children’s Society, the Down Syndrome Association and the National Autistic Society. The group works together to discuss relevant topical areas of practice and concern, and to develop useful resources. More information on the group, as well as an info sheet with the contact details of all the support networks offered by our members, can be found on the IASS Network website. appeal against its decisions and support to make that appeal if they need it. The financial strains of the past few years can also be a convenient mask for a deliberate attack on a service which is providing challenge to LA practices and failings. which they could properly investigate, and which never materialised. demanded of the original team by senior managers. Whither impartiality…..?